PhotoELF is ... "The Swiss Army Knife of Photo Editors"
Free upgrades / replacement for 1 year. View, Edit, Print and Organize your Digital Photos. Dozens of easy to use Batch Editing features to make editing thousands of photos fast! Printing Photos on Envelopes, LetterHead, Labels etc. PhotoELF is not just for Digital Cameras! PhotoELF will work with any pictures found on your computer, CD-ROM or Floppies. Whether you are new to digital photography or a seasoned professional, PhotoELF Software will make printing photos easy and fun. PhotoELF is not just the best photo printing software program on the market, it also is a complete photo editor software package with hundreds of other digital photo features, like removing red eye, converting image formats, creating photo albums to burn onto CD-ROM, Slide Show features, batch renaming, batch converting formats, batch resizing, batch JPG compression and many many more features. Download the best photo printing and editing software package now! It is free and fully functioning for 30 days. 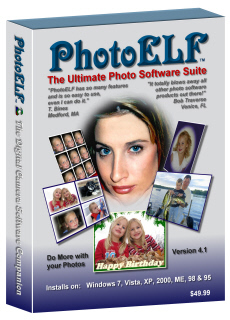 If you like how PhotoELF works, you may return to this site and purchase the download or the CD-ROM.